The Blue & Gold Foundation offers grants throughout the year that help the students and faculty of Chamblee High School. To apply for a grant, please complete the form below and submit it to the board. A board member will contact you shortly to discuss. 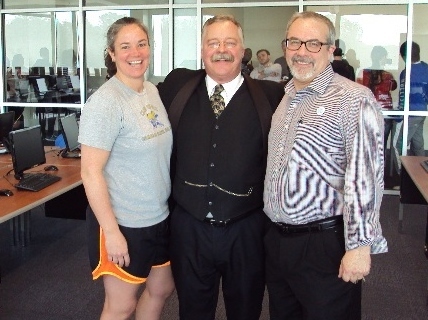 Teachers Jennifer Tinnell and Steve Rubino are visiting with a Theodore Roosevelt historian who spent the day with CCHS students through a grant request given by the Blue & Gold Foundation. How will students or teachers benefit from the grant? How many students will benefit from the grant? When will funds be needed? To whom should the funds be disbursed?